We previously wrote about receiver-based vibration isolation systems – isolation pads or platforms that sit right below electron microscopes and other sensitive nanoscale imaging tools. In that discussion, we pointed out that these systems are more effective at reducing micro-vibration at higher frequencies than at lower frequencies. In fact, a major component of the vendors’ marketing materials is to demonstrate good low-frequency performance, often by citing a system resonance or "isolation frequency". Just like machine vibration isolators, lower is better. This is important because many common imaging tools are more sensitive at lower frequencies. What’s more, floor vibrations in labs aren’t uniform across the spectrum: there might be more or less low-frequency content to begin with. But what governs how much energy we see at different frequencies in the spectrum? Here’s an example micro-vibration spectrum. These statistics are based on data taken across the footprint of an aging university laboratory. Obviously, there is a lot more high-frequency than low-frequency vibration. While not shown here, the narrowband (high-resolution) data indicated that building machinery vibrations dominate at high frequencies. Based on the data, this site meets the “VC-C” criterion of 500 micro-inches/sec (12.5 micro-meters/sec); however, it could perform far better if mechanical system vibrations were addressed. This “mix” of energy content in the spectrum isn’t completely random: different kinds of sources contribute to or even dominate different parts of the spectrum. The first and most obvious distinction between different "kinds of sources" is local vs. environmental. Local vibration sources are those things in and around the building itself: machinery, foot traffic, structural/foundation systems, the parking lot. Environmental sources are those things external to the building: roads, transit lines, rail corridors, even the “seismicity” of the regional geology. Here’s another example micro-vibration spectrum. These statistics are based on data taken at a proposed site for a university imaging center that would house vibration-sensitive electron microscopes. As you can see, there is a lot of energy down at around 2Hz. Based on the data, this site meets the “VC-D” criterion of 250 micro-inches/sec (6.3 micro-meters/sec). There's not much you could do to improve this site, since the spectrum is dominated by ground vibrations arriving from outside the building. What is interesting about this differentiation is the degree of control that might be exerted over those sources. The owner of a vibration-sensitive laboratory building has far more control over local sources than environmental sources. During design and construction, the owner and design team can aggressively isolate new or existing building machinery or lay out the project so as to increase local distances between sensitive labs and vibration sources. But the owner typically has little or no control over environmental sources: traffic from city-owned streets or nearby rail systems might dominate, and nobody can do much to improve the regional geotechnical condition or alter the soil dynamics that determine long-range ground vibration propagation. It’s true that a large entity like a university or a national lab will sometimes be able to influence the local authorities that operate and maintain nearby roadways or transit lines. Additionally, on large campuses the owner’s own roads might be relevant. These are important special cases, and the owner should use its resources and position to demand maintenance schedules or alignments that minimize the ground vibration impacts from these sorts of sources. But in general, you can think of environmental sources as things that are practically beyond anyone’s (straightforward) control. It turns out that there is an important rule-of-thumb when it comes to micro-vibration frequency content from these two kinds of sources. 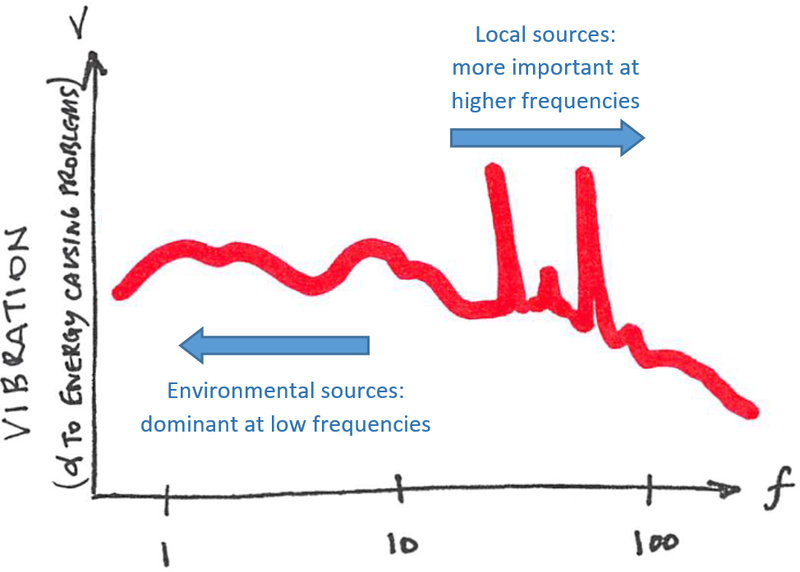 In general, environmental sources tend to dominate at low frequencies, while local sources are often more important at higher frequencies. This is all down to physics: low frequencies travel farther in soil, so we don’t often see a lot of high-frequency ground vibration from far away; meanwhile, machinery vibrations are strongest at the RPMs of the shaft speeds, so building machinery creates the greatest vibrations mid- and upper-spectrum frequencies near 15Hz (900RPM), 30Hz (1800RPM), 60Hz (3600RPM), etc. A decent rule-of-thumb for building vibration, including low-vibration labs and other engineered settings: environmental sources like traffic and nearby rail lines tend to dominate at low frequencies, while local sources like building machinery tend to control at high frequencies. Obviously, there are exceptions, but this is a reasonable starting point when trying to decide if a site can be made to work for sensitive uses like electron microscopy. This distinction is important because environmentally-driven building vibration is very difficult to mitigate against. So it’s important to be able to understand where those floor vibrations are coming from, and whether you have much ability to do something about them – other than moving to a low-vibration lab space at a remote location. Older PostFloor vibration: how fast do people walk in buildings?